In the politically highly charged post-mortem into negotiations between the Syriza government and the Euro-area powers, one fact should not be overlooked. In spite of the widespread view that Athens suffered a humiliating set back at the hands of the German government and its allies, the latest opinion polls show that more Greeks than ever support Syriza – enough to give them an overall majority in a new election. This should not be entirely surprising. The mass of Greek voters do not blame Alexis Tsipras, or his finance minister, Yannis Varoufakis, for the dogmatic refusal of Berlin and Brussels to recognise that their austerity strategy has failed. They also believe the Euro-area leaders – as well as Syriza – also had to make concessions. As the US economist, James Galbraith has put it: “What happened was that at the end of the day, the creditor countries and the creditor institutions took a step back. There had been through the entire process a very firm position taken by the German government that you had to sign up to the existing loan program, all of its conditions, lock stock and barrel, no changes that the elections have really meant nothing. This was an untenable position. It was a position that over the time of these discussions lost the sympathy of the European Commission, and I think also of the International Monetary Fund, and also of several other major governments. And it was a position from which the German government at the end of the day took a step back, agreeing to the essence of the Greek position all along, which was to have a financing arrangement that would be in place over a four-month period, and then discussions about the specific terms, based upon a list that was submitted yesterday to the institutions. No one in their right mind would suggest that Syriza is winning the struggle to defeat mindless austerity or that the pressures on Athens to retreat will not be re-doubled in intensity in the weeks ahead. I agree with those who urge Tsipras and his comrades not to gloss over the compromises they have been forced to make or the profound challenges ahead. In that sense, they should emulate the Russian Bolsheviks who never denied the terrible price they had to pay to Imperial Germany for the Brest-Litovsk treaty ending Soviet involvement in the First World War. Some of the criticism of the Syriza strategy made by the Greek and international far left is, however, based on misunderstandings. For example those calling on Athens to defy Berlin and impose capital controls to prevent money being drained from the banks do not realise that this can be done under Euro-area rules. This what the Cypriot authorities were forced to do last year. It may be something Syriza adopts but the recent statistics show that capital is starting to return to Greece. Leaving aside the Greek neo-Nazi and populist far right, and a small minority on the left, the mass of Greek workers rightly suspect – indeed fear – talk of abandoning the Euro. They remember the disasters which Drachma devaluations brought in the past and suspect it would mean an even more terrifying collapse in living standards. But are the Greeks right in believing that Syriza should struggle to change the Euro-area, indeed the European Union itself, from within? Is there the remotest chance that Syriza could trigger a shift in the balance of class forces needed to secure a radical change of economic policy? Where in the EU are the allies to be found else to bring this about? It is essential here to avoid exaggeration. But there are some signs that popular opinion in most EU countries is swinging against any prolongation (let alone intensification) of austerity. It takes different forms in different countries. In Portugal even the leader of the Social Democrats (the Mayor of Lisbon), who is favourite to win the next election, has declared he will negotiate an alternative agreement with the Euro-area authorities. Of course we should not hold our breath. But the financial markets will be quick to see another crisis point in Portugal if talk of an economic policy change grows. Should a forced Grexit be seen as pre-figuring a possible Portuguese or even Spanish default, Berlin will be at risk of losing astronomic amounts of money. Indeed why stop there? Market suspicion could easily fall on France and/or Italy – which may be why Berlin has just agreed to give both government more time to come into line on deficits and debt. Of course the right wing governments in Lisbon, Madrid who have insisted on the unpopular austerity policies are desperate they are not exposed by any concessions given to Athens. The European Commission has already signalled it favours some relaxation of the current terms of the Greek austerity “agreement.” The balance of opinion in the elected European Parliament is in favour of even more substantial concessions because austerity has only succeeded in increasing rather than decreasing indebtedness. 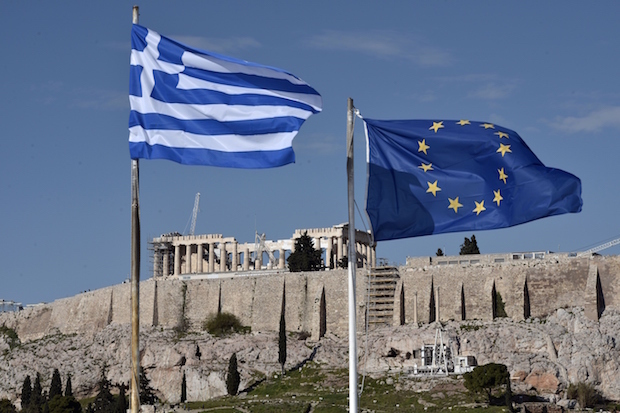 Another important factor working Greece’s favour is the growing alarm among mainstream academic economists that the austerity card is being overused. In any future policy review it would not be surprising if even bodies like the IMF and the European Central Bank signalled to Berlin and its allies that some fiscal relaxation was in order. None of this is to attribute any inherent or dependable progressive orientation to the EU institutions. They reflect the ideological tenor of the great majority of pro neo-liberal EU national governments. Nor can any confidence be placed in the mainstream social democratic parties whether in opposition or in coalition with the right – as in the case of the German SPD. But political parties have to keep a keen weather ear on the fluxes in public opinion. Tolerance of austerity is wearing thin which is one reason why some even the populist far right – such as the French FN – is giving expression to public anger about public spending cuts and falling living standards. Important in this context are the signs of a new restiveness stirring among workers in both northern and southern European countries. In Germany the Metal Workers have just forced through a major, inflation busting wage increase and public sector look set to follow. There have been strikes by airport workers against job losses in Denmark, Finland and by Portuguese transport workers against privatisation plans. None of this is to suggest an imminent change in the economic or the political balance of forces which Syriza will have to confront in its struggle to survive and to win tangible relief for the Greek people. Pressure is growing from hard line right wing German tendencies (Alternative fur Deutschland, PEGIDA but also within the CDU/CSU) against any concessions to Greece. A swing to the right in the recent Hamburg election brought Merkel’s CDU percentage vote down to the mid-teens. Little wonder Schauble and co are worried. I agree with those in Syriza (and commentators like David Renton) that Syriza must strengthen the societal groups at its base and ensure the government is more actively accountable to them. This will, however, involve these organisations also taking some very hard decisions on priorities and compromises. The Greek foreign ministry should be encouraging the maximum contact between Greek social interest groups – obviously including the trade unions – and comparable organisations throughout the European Union. The next weeks will be crucial. It will be essential to use the maximum political leverage to ensure a substantial revision of the terms of the policy review. But Syriza cannot avoid having to play a longer term strategy. It should be judged by how it balances these priorities with maintaining the commitment of its support base to fundamental change both in Greece and throughout Europe. That is why it is bound to be a lengthy war of positioning.